This beautiful 14 K gold Omega slider is hand sculpted in 3-D and shows exquisite detail. 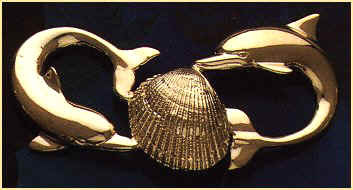 It has two dolphins holding a clam shell and weighs approximately 8.3 grams and has a high polish. It measures approximately 55 mm by 27 mm.